Israel soldiers injured, Friday, twenty-three Palestinians, including some who were shot with live rounds, after the army, stationed across the border fence, attacked protesters, who marched in several parts of the Gaza Strip. 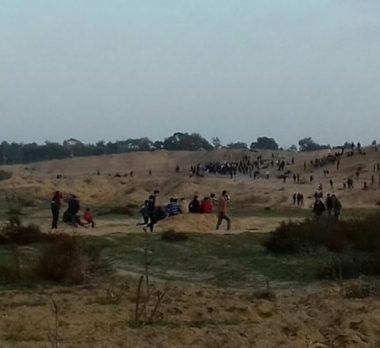 The soldiers, stationed on military towers and behind sand hills near Nahal Oz base across the border fence, east of Gaza city, fired many live rounds at Palestinian protesters, moderately wounding a two man, in addition to causing many others to suffer the effects of teargas inhalation. The soldiers also opened fire on Palestinian protesters, east of Jabalia town, in northern Gaza, wounding 13 Palestinians, and east of the al-Boreij refugee camp, in central Gaza, wounding three. In Beit Hanoun, also in northern Gaza, the soldiers stationed near Erez Terminal, shot two young men with live fire, causing moderate wounds, while one Palestinian was shot with a bullet in his leg, north of nearby Beit Lahia, and many others suffered the effects of teargas inhalation. In addition, the army shot and moderately injured five Palestinians with live fire, east of Khan Younis, in the southern part of the Gaza Strip, and caused many others to suffer the effects of teargas inhalation.